Access your Email in real-time while away from your office or your primary computer station. Fast and intuitive, HostSellers' Webmail is packed with all the communications tools you need like online calendar, task lists and advanced contact management. These powerful features make Wemail a perfect solution when on the road and a professional complement to common PC mail management programs. 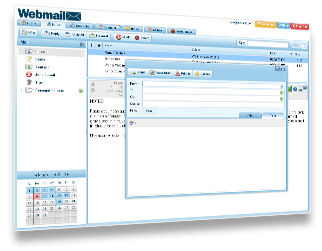 FLEXIBLE: HostSellers' powerful easy-to-use Web-based Email system allows beginners or advanced users to incorporate their Webmail with scheduling, task management, contact management, and POP3/IMAP access. ACCESSIBLE: Webmail can be accessed anywhere and at any time using an Internet browser. Whether you are at home, in the office, or traveling on business; Webmail can be accessed by simply logging on to the Internet. You will have full access to all Webmail features including Email, calendar and task management tools, contacts, and more. SIMPLE: Webmail is perfect for every level of user. This feature rich, easy to use application is designed for beginner and advanced users alike. The simple interface has an easy navigational process and no special training is required. If help is required, an online help system is available to guide you and your staff through all of the Webmail functions. HostSellers' technical platform has a high level of fault-tolerance and system redundancy, allowing it to perform flawlessly even if several hardware components should fail simultaneously. Our use of RAID technology in our storage architecture also ensures that no data is lost. The platform is also capable of withstanding the majority of Denial-of-Service (DOS/DDOS) attacks, with little or no loss in performance. The HostSellers Email platform is monitored 24/7 by our system administration team. In addition to daily system performance audits, we employ several proprietary automated monitoring systems to ensure that our mail system always runs at peak efficiency.